Your browser does not support the video tag, please update it with a newer version. 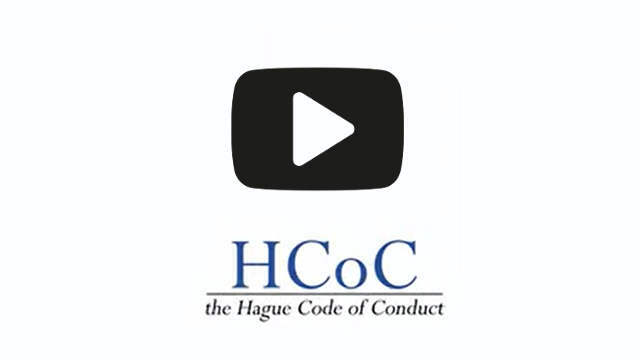 The Hague Code of Conduct against Ballistic Missile Proliferation (HCOC) is the result of efforts of the international community to internationally regulate the area of ballistic missiles capable of carrying weapons of mass destruction. The HCOC is the only multilateral transparency and confidence building instrument concerning the spread of ballistic missiles. Since the signing and entering into force of the politically-binding HCOC in November 2002 in The Hague (Netherlands) the number of signatories has increased from 93 to 139. Austria signed the HCOC in 2002. As agreed by the conference in The Hague, Austria serves as the Immediate Central Contact (Executive Secretariat) and therefore coordinates the information exchange within the HCOC framework. In 2011 a new HCOC website was created with EU financing (www.hcoc.at). The link between the UN and the HCOC, a multilateral code negotiated outside the context of the United Nation System, is established with the Resolutions regarding the HCOC that were adopted during the 59th, 60th, 63rd, 65th, 67th, 69th, 71st and the 73rd UN-General Assemblies in New York. Since the entry into force of the HCoC in November 2002, annual Regular Meetings of Subscribing States to the HCOC (annual conferences) are held in Vienna. The 17th Regular Meeting took place from 28 May to 29 May 2018 under the chairmanship of Sweden. The 18th Regular Meeting will take place from 3 June to 4 June 2019.